Well, it is finally time to move on and show how I finish setting up for a draft (Part 1). I was hoping the following article was going to be in two parts and have a little more detail and polish. Instead I am have been dealing with a fan error on my computer and a pile of oil under my car. Neither is really resolved. So with a borrowed computer, I will step through the rest of my procedure. Let me know if you have any questions. Note: For reference, here is my spreadsheet I used to get the initial SGP values and has the rest of the sheets referenced in this article. We left off with me going over the projections to see if there were any stat lines I disagreed with (I didn’t make many). This is the time to make changes for bumping players up or down. This step is to make sure perspective is added to any changes. I may be high on Mike Moustakas and may end up over valuing him. It would be wrong to take him in the 4th round when his value may have only jumped from the 18th to the 12th round. I make sure the middle infield and corner infield have at least 15 players to fill each position. Third base was the closest with 16. For Utility, everyone not in a position gets grouped here and the last player, Ender Inciarte and his 11.3 SGP, is the replacement level player. Now, here is the lowest SGP value for each of the other groups in which the replacement level value is compared to. All the lowest ranked players at each position have a higher SGP then the lowest utility player except catcher. The catcher position gets really thin since thirty of them are in play. Also in 2014, there are not many dual eligible catchers besides Lucroy and Gattis. The last ranked catcher than needs to be at the same SGP level as the lowest Utility player, so all catchers get a bump of 4.9 (11.3-6.4) to their values. Once this list of hitters is done, they are the only players I will draft since I have all the top hitters. Now, I do the preceding procedure with pitchers. I include starters and relievers in the same group for now. I just need 135 pitchers (Pitcher Replacement and Tiers sheet). I just go with the entire group because most of the time all the Save/closer candidates will be included. If one isn’t, I would likely include him and bump another pitcher out. Now I have my 345 players (hitters and pitchers) which I would draft if I was to do it for all 15 teams. At this point, I will ignore everyone else. My next step is to find any tiers. What I have found historically is there is really only 2-4 tiers of players at each position. To find the tiers, I go back and regroup the players by individual positions (no MI or CI groups). The data can be found on the “Pitcher Replacement and Tier” and “Hitter Tiers” sheets. Then I create a graph of the players from high SGP to lowest. 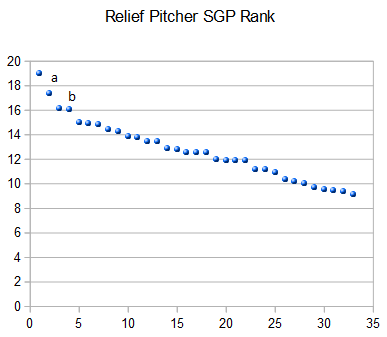 Here are the graphs for the Outfielders and Relief Pitchers. What I have found is there is a curve down in talent and then the talent still declines, but in a straight line. The tiers are found in the curve. With the non-tiered players, one player is not significantly better then the next one on the list. The difference is nearly the same. I just simply mark the tiers with aa (standout), a (first tier), b (second tier) and no marking for the last tier on my spreadsheet. For example, Carlos Gonzalez is 0.8 better in SGP than the next player I have ranked, George Springer. If I go down 0.8 from Springer, four players are included. I try to grab as many of these top tiered players as possible. Once the top tiers are taken, I just move to best available player and fill my position slots. A full look at my tiered players can be found in this spreadsheet under Hitter Tiers and Pitcher Tiers. I combined the pitchers and hitters into one spreadsheet ranked by SGP with the tiers desigantions. The next step is to get an Average Draft Position (ADP) report from the website hosting the draft. In my case it is Real Time Fantasy Sports. As much as people won’t admit it, a sites rankings influence when players get taken. The site’s rankings get baked into the ADP. By copy-and-pasting, I can have a full list of where players have been going (ADP Compare sheet). I put the ADP list next to my rankings and begin what I feel is the most important process, setting up the draft for few surprises. First, I set up my top one to three picks depending on the number of teams drafting and my draft position. I set a preferred draft order and just move on. Sometimes people don’t know their draft order until right before the draft so this step can be rushed. I have found out I pick third. After looking over the top picks, I will take Trout, Stanton and then McCutchen. This is not the exct order of my rankings, but close enough. I like the youth/dependability of the trio even though there is zero chance Trout will make it to me. My next pick is 24 picks later. A lot can happen between my 1st pick and my 2nd so I will not map out my 2nd pick. I am going to be drafting like I am on the turn. I can’t react to any positional runs and will just have to hope my rankings hold up over the course of the draft. I may have to take a relief or starting pitcher a round too early so I have the opportunity to get one I want. The one item I will do at this position is keep track of the positions filled by the two other players on the turn. If am deciding between a 3B and 2B, I will know what positions they have filled so far. If both have a 2B, but neither one has a 3B, I take the 3B and see if the 2B slides through to my 2nd pick. With everyone already ranked and 24 picks between mine, I have plenty of time keep track of the two rosters and cross off the other players drafted. The next step is huge. I feel everyone can basically get to this point using various methods like an industry ranked list. Now it is time to break out the an ADP list and compare it to my rankings (ADP Compare sheet). My goal is move players down in the draft to make them a good buy. The first item I notice is the ADP draft data seems way too pitcher heavy at the top of the draft. I will be with other industry “experts” and there is almost no chance three pitchers will go in the first round. In this mock draft run yesterday for experts, Kershaw didn’t go until #9 overall and only four pitchers went in the first two rounds. I won’t drop the overall ADP list. I like the it so one player doesn’t stick out, but I expect pitchers to drop a bit in my draft compared to an average draft. Next, I start going over my rankings to see any players can be taken later in the draft compared to where I have them valued. I group my rounds together because the picks are so close together. If I find player I think I can wait on, I will list them in that round and hope they may fall to me. It is a little risky, but well worth it at times. Here are some examples. My 6th and 7th rounds are grouped together, so I will look at getting his there. David Oritz and Charlie Blackmon (3 round picks) are also options here. I am going to take a chance and get him in the 14th/15th rounds. I will put him in the 10th/11th round for my 5th ranked closer. I have not completely gone through every player yet, but I have added some to the sheet labeled “Picks”. I can not emphasize this part of draft prep. If done right, I can be getting fifth round values in round ten or later. Besides all the preceding steps, here some general rules I will follow based on the league size and year. I am going to wait on outfielders and starting pitching once the top tiers have been drafted. Both are extremely deep this season with not much of a differentiation at the end. I will probably end up drafting a pitcher with one of my 2nd/3rd pick and 4th/5th pick. One of the pitchers may be one of the four elite closers. I have noticed 19 starters and four closers in the top tiers. I would like to end up with at least two of the 23. I will start the season with two closers. In a 15 team league, two closers per team will be the average, which is fine. I don’t want to be completely in the hole with Saves if my only closer goes down. Also, I will try to end up with at least one with good rate stats. Saves with a high ERA and WHIP can be hell on rate stats. Additionally, in expert leagues, owners like to dump Saves, so I don’t want to be chasing Saves with three to four other owners. I am going to try for two of the top 15 catchers. The drop off is huge to the bottom few compared from the top ones. When deciding between two pitchers, I will take the one with the higher K’s and hope their BB’s drop. Rarely do K’s go up. Take a few notes. This is how I noticed I can wait on my last few OF and SP. Well, I think that is it. It may seem like a ton, but it is nice to have the thinking done before going on the draft clock. I will go over the draft tomorrow and see how my plans did and didn’t work. We hoped you liked reading Sample Draft Prep (Part 2) by Jeff Zimmerman! Exactly wrong. What the SGP values are telling you is how worthless a catcher is to take–the best only add 6.4 SGP while the worst still add 1.5. They just aren’t worth that much to your roto score. Imagine if you had a different position, say Bat Boy. Bat Boys through some dark magic are able to add between zero and 2 SGP to your totals. Would you add a position adjustment to bring them up to the lowest Utility player? NO. You want to maximize real SGP, period. The “adjustment” SGP you are adding aren’t real and won’t help you win. Even though you won’t get the actual points gained by the catchers, the difference is important. If I took the next step and converted the SGP to $$ I wouldn’t need to adjust for C replacement level. For those people who have it, Larry Schechter explains this adjustment starting on page 121 in his book. Doesn’t address the basic problem that maximizing overall SGP isn’t the same as maximizing SGP for a single position or pair of positions. No. The whole goal is to MAXIMIZE SGP. There is no particular reason to believe that maximizing that function will occur simply by maximizing SGP for a single position. Regardless of the method used, the point should be to maximize your value relative to your peers at each position. 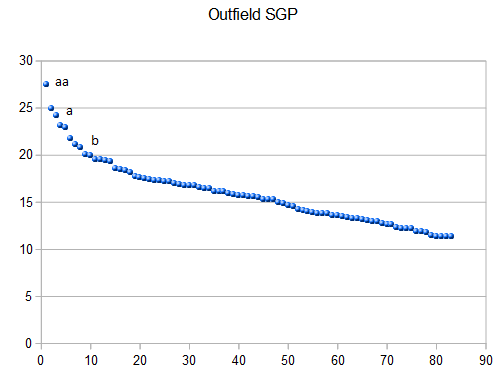 If, in a hypothetical draft situation, the difference between two outfielders is 2 SGP and the difference between two catchers is 4 SGP, it doesn’t matter how many SGP each player earns – you want to take the catcher to ensure that you have more SGP relative to your peers. So it’s important to factor in how scarce a player’s production is relative to his position. Now, I agree that adding arbitrary SGP is not a good way to factor in scarcity. But these points aren’t arbitrary – by equalizing the floor of each position (bringing the worst rosterable players to an even level) you can see how high the top stars soar. If, say Buster Posey had a bigger gap between himself and the #2 catcher than any #1 and #2 player at any other position, there is a case to be made that Posey is the most valuable guy on the board (of course he never would be, because catcher risk and the high floor of catchers in a 1 catcher league). If you leave catchers with an unadjusted score, this gap will be buried at a middling SGP and Posey won’t appear as valuable as he actually is. What I’m saying is that the adjustments unmask the hidden value of a player who is dominant relative to his peers at a respective position. If you maximize your advantage at each position, you’ll have a strong team. By just using unadjusted SGP, Buster Posey is at 16.4 and 21.3 once adjusted. If I don’t adjust for replacement level, I take Tulo and Hundley for a total of 27.6 unadusted SGP. If I take Posey and Inciarte, I end up at the same unadjusted SGP of 27.7. If I wanted to, I could drop everyone’s value to Hundley’s. Also, the adjustment is extremely important in auctions. The SGP can be converted to $$. If you don’t adjust, all the bottom catchers would be at $1 and the position players will start around $5. Both should be at $1. You are arguing that, merely because Posey is playing catcher, he is equivalent value to Tulowitzki even though the actual performance he will contribute is that of Nelson Cruz, 55 spots later in your hitter ranking. That purely due to your positional adjustment he should be jumped to a pick around 12 to 15 up from around pick 100 or so, where his actual level of production would place him. So, just because he is a catcher, you are willing to give up a second-round level of actual production in favor of actual production at the 8th to 10th round level. Are you better off, for example, with Tulowitzki and, say, Salvador Perez (available around pick 100) or Posey and Alexi Ramirez? Tulo + Perez = 32.8 SGP while Posey + Ramirez = 29.5! The choices of Perez and Ramirez are arbitrary. Jeff answered this question using the actual replacement players and found the difference to be negligible. No, they are not arbitrary. They reflect the real choice being made, much more accurately than using replacement level players. Did you pull them from the rounds of the draft where Jeff took catchers or shortstops? Otherwise they are arbitrary.